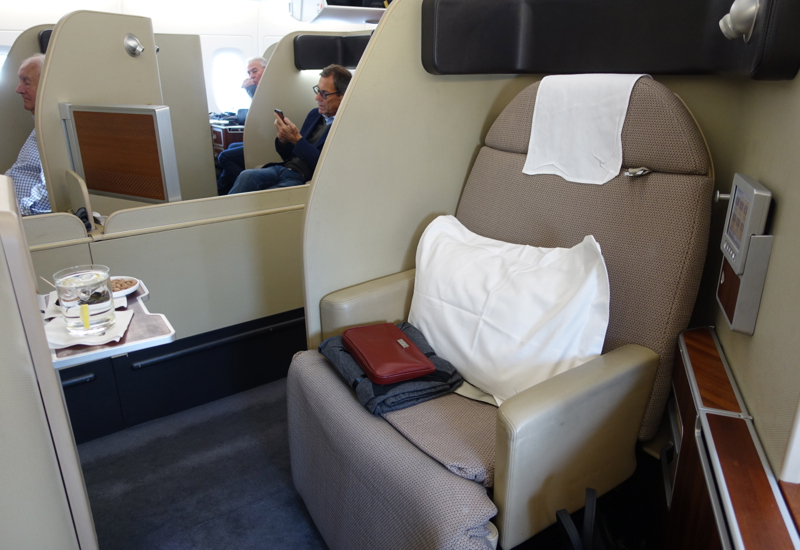 See my prior review for more on the Qantas A380 First Class cabin and open suites. 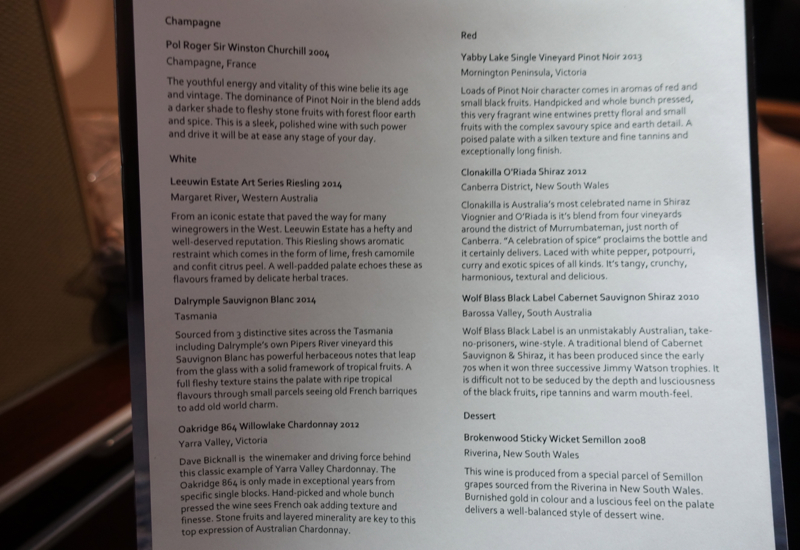 We kept our same suites, 2A and 3A, for our flight from Dubai to Melbourne that we had been in on the London to Dubai flight. Since the aircraft is cleaned, however, we and the other passengers did need to take all our carry-on luggage and belongings with us during our layover in Dubai. 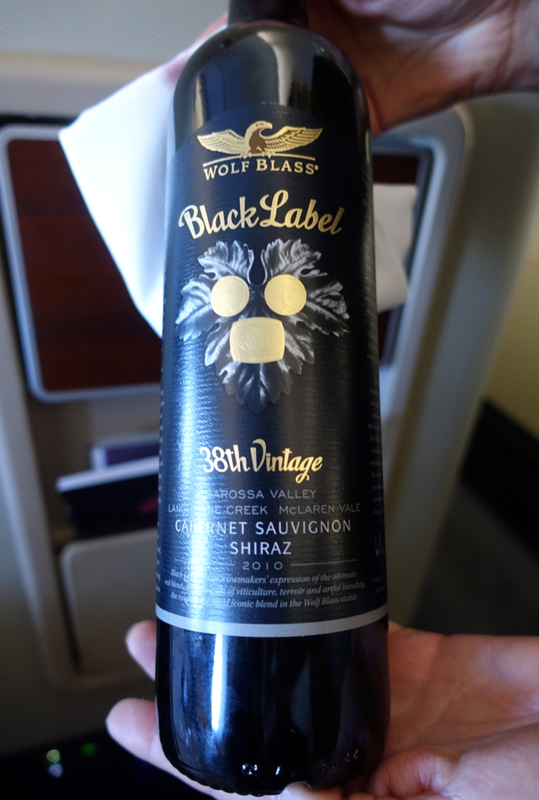 I'd tried the Black Label Cabernet Sauvignon Shiraz, 2010 on the prior flight, and it was a nice, fruit driven, robust red–a great pairing if you order a meat dish, though I wasn't up to any heavy meals for this flight. 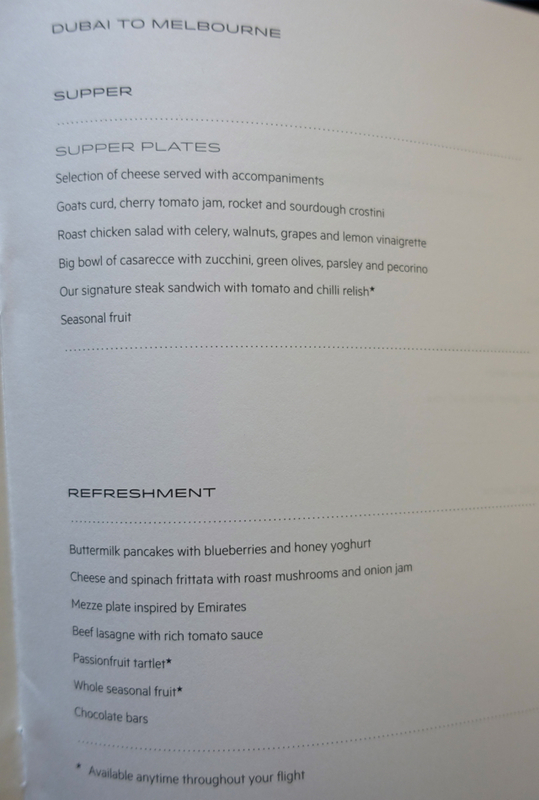 There was a supper menu, although as we had recently dined in the Emirates First Class Lounge in Dubai we weren't hungry enough to order anything from it. 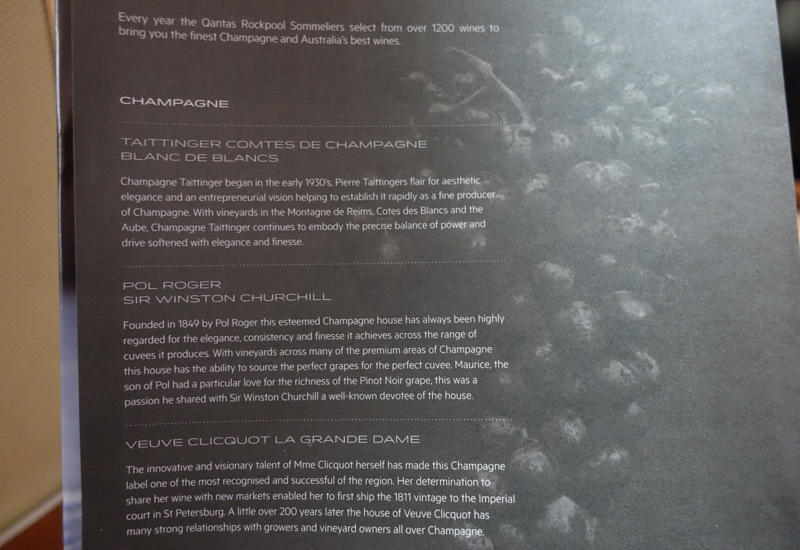 I did, however, notice some passionfruit tarts on the refreshment section of the menu and asked if one could be saved for me for later in the flight. About mid-way or more through the flight, I felt like some salad followed by some breakfast-type food. 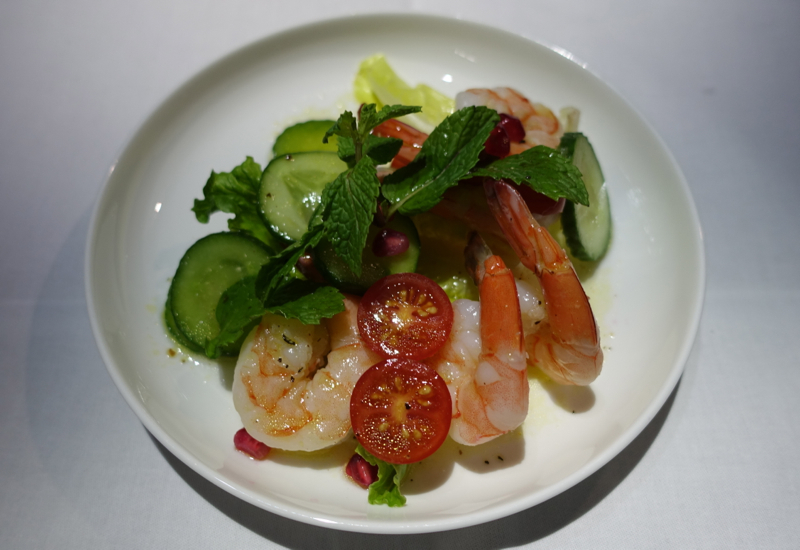 I began with the simple but wonderfully fresh prawn salad with cucumbers, pomegranate and mint. I've never had this exact combination, but it was delicious and really hit the spot in terms of something light and flavorful. 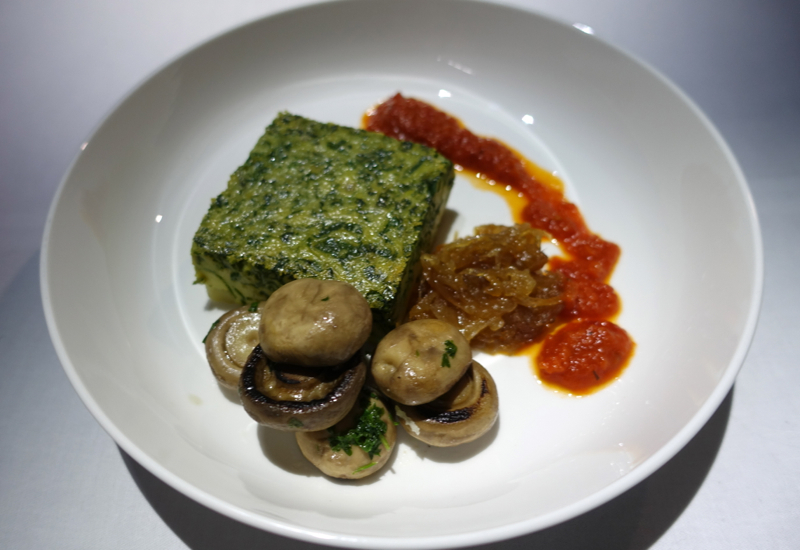 Next I had the spinach frittata with onion jam. This was good and exactly what I wanted at the moment–an egg dish of some kind–but isn't the thing to order if you're looking for something innovative or unique. 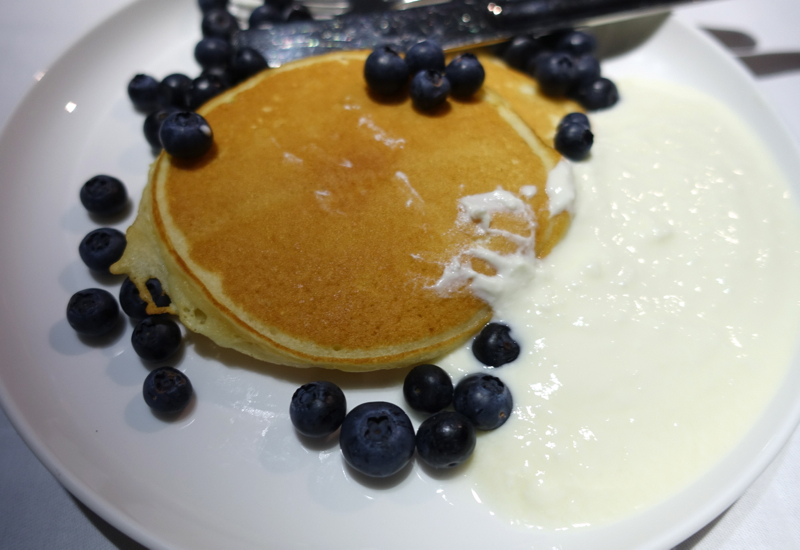 My son initially wanted the blueberry pancakes with blueberries and honey yoghurt, but after one bite decided he was still very full from the huge Wagyu burger he ate in the Emirates Lounge, so he didn't want any more. I tried the pancakes, but as a bit of a pancakes snob I decided they weren't worth the calories, and instead finished the honey yogurt with blueberries that they were served with. 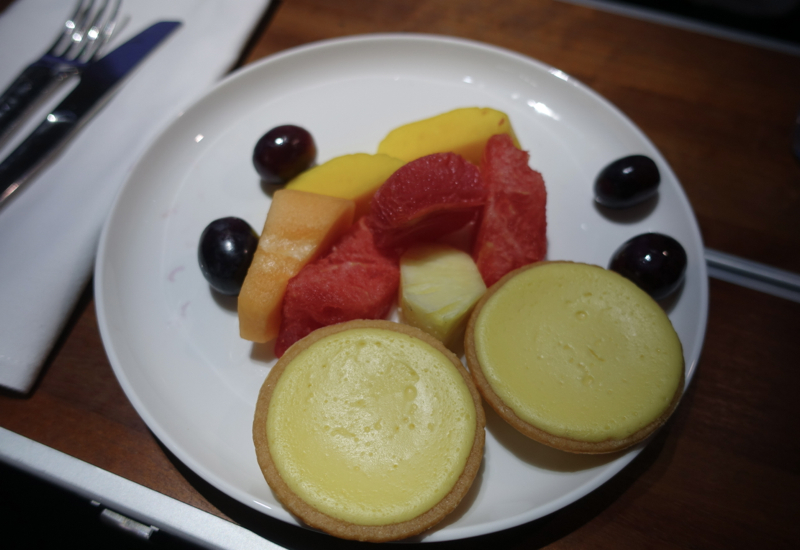 Finally, a bit before landing, I asked for some fresh fruit with one of the passion fruit tarts that had been saved for me, and was even brought a couple of them. These were really good–highly recommend saving room for one of them if offered on your flight, and if you enjoy passion fruit. While I love movies, my priority on flights is usually getting some sleep, ensuring my son gets some sleep, and getting some work done, so I don't watch nearly as many films as my husband does on flights. 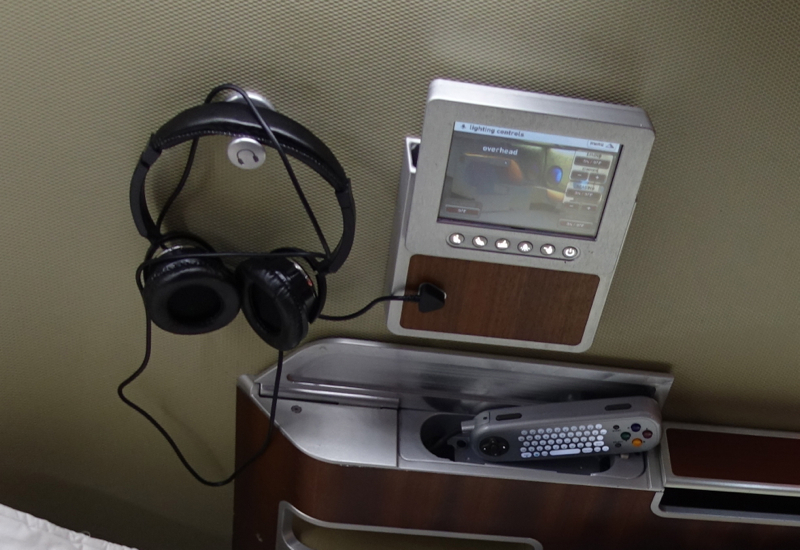 Noise cancelling headphone snobs may want to bring their own, as the ones on offer aren't Bose, but they worked fine for me, and since the connection was with the usual prongs, I didn't have the horrible connection issues I experienced in Etihad 787-9 First Class. The actual screen is a bit small compared to some other first class screens; for example, Singapore Suites on the A380 and JAL First Class both have a 23 inch wide screen, and Asiana First Class Suites have a 32 inch screen, though it didn't matter to me, given that we purposely don't have a TV at home. 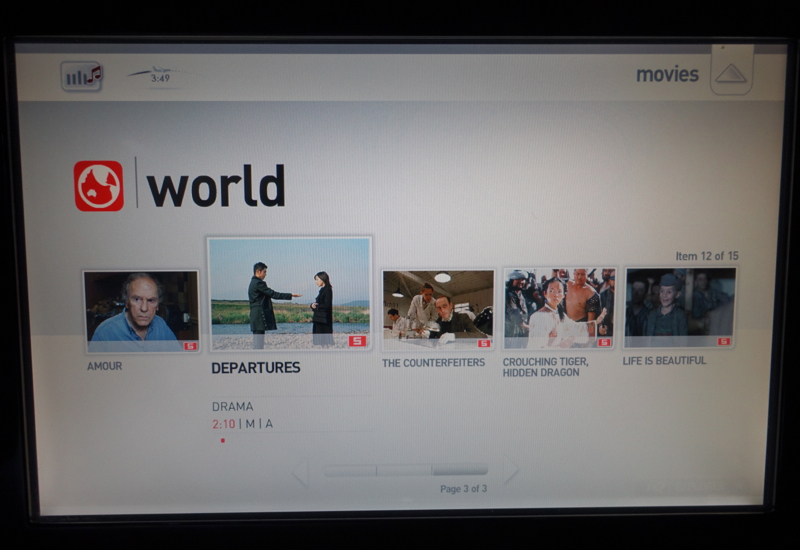 Once I got around to exploring the Qantas in-flight entertainment system, I was happy to see a decent selection of foreign language films. It's not Singapore Airlines (where I tend to take the IFE movie descriptions with me for inspiration) but I noticed the Japanese film “Departures,” which I'd previously enjoyed, and also “The Counterfeiters,” which I was keen to see, as I remembered it had won the Foreign Language Academy Award a few years ago. I asked if our beds could be made up as soon as possible after taking off. Somehow the flight attendant I spoke with didn't quite understand, so I had to remind her while she was making up another passenger's bed, after which she was apologetic and as soon as she had finished she did make up my son's bed, and later, my own. My son had slept little on the prior flight, which was mostly a day flight, but by this time it was past his normal bedtime and he was very tired, so he slept for much of the flight. The ride, as the pilot had warned us, was a bit bumpy, so I didn't sleep as well as I'd hoped, but still about 4-5 hours, and every bit counts. 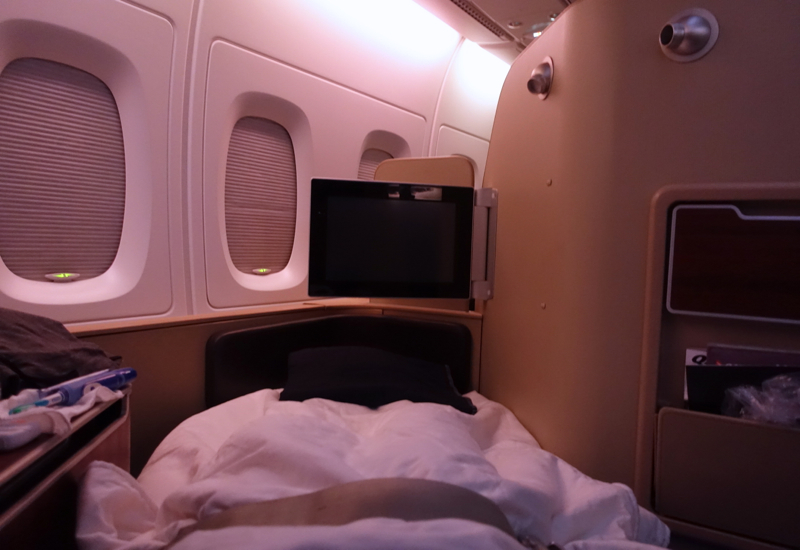 The bed is pretty comfortable, but as I've mentioned in my other Qantas First Class reviews, the mattress padding isn't as thick or as comfortable as the one you get in Singapore Suites and JAL First Class. Our focus on this flight (and many other passengers' focus) was on sleeping, and apart from the slightly bumpy ride, which is luck of the draw and can't be helped, it was a good flight for that. 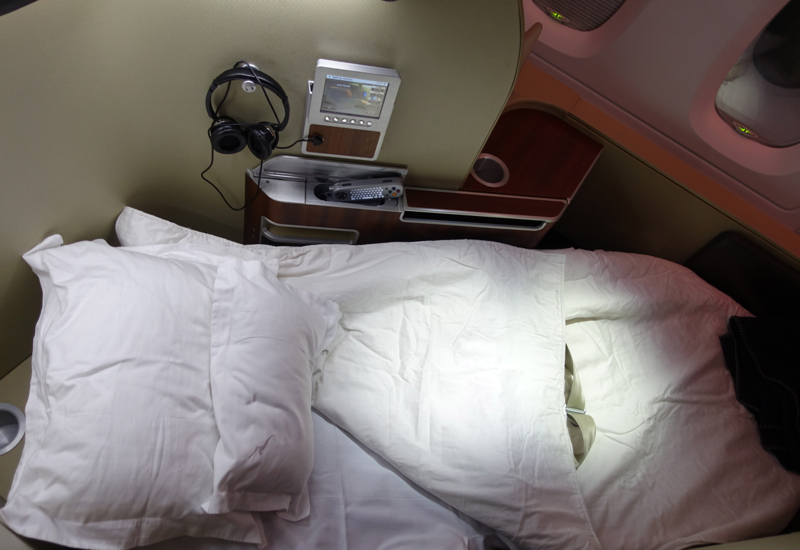 My son slept most of the flight, which I was thankful for since he needed it, and I slept about as well as is possible given that I'm a light sleeper, though I would have appreciated a thicker memory foam-like mattress pad. 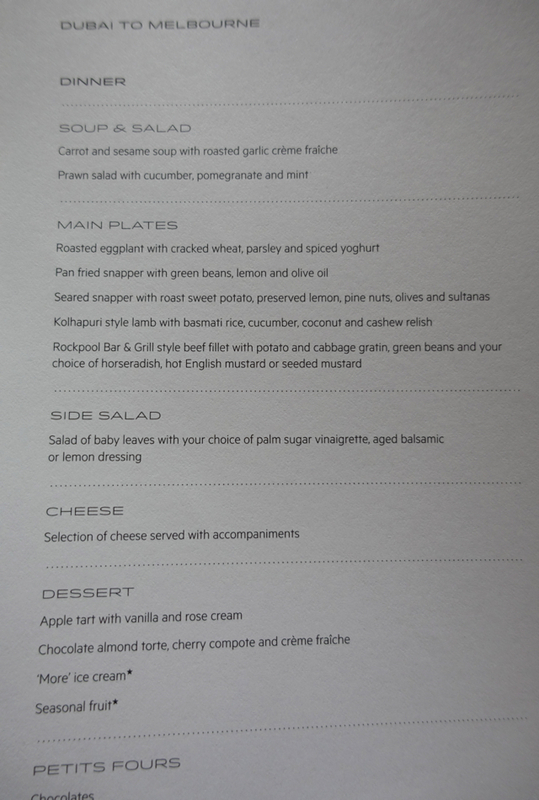 Food took a back seat for us this flight, but there were plenty of choices so that I was able to eat exactly what I was in the mood for–lighter, breakfast-type fare. The pancakes weren't good, but then I've never had pancakes on an airplane that I would rave about, at least compared to great restaurant ones.